Your baby sleeps like a champ all day but wants to be up bright-eyed and bushy-tailed in the middle of the night. Many babies have some day/night confusion when they first enter the world. If you follow Babywise or Baby Whisperer principles of Eat/Play/Sleep, you are less likely to have it, or will have it a shorter time or less intensely. There are some strategies you can apply if your baby wants to be awake in the night more than in the day. Waking baby up regularly at 3 hour intervals in the daytime will help with day/night confusion. Be sure to stick to your 2.5-3 hour routine in the day as closely as possible (always feeding baby sooner if baby is hungry). Work to keep baby awake for feedings so she gets full meals all day long. If your baby will nap with the blinds open, leave them open for naps in the day. Three of my four children have napped great with blinds open as babies. McKenna wouldn’t even as a newborn. If your baby will sleep, keep the blinds open to help baby’s body know when day is happening and when night is happening. When you feed baby at night, keep things dark and calm. Whisper if you need to talk. Keep lights dim. This is going against everything I just said. The tips above are all good and are from sleep experts. However, sometimes doing all of those things doesn’t solve the problem. They will say “give it time,” but when you are in the moment and it is 12 AM and your cutie just wants to look around, you don’t want to wait a couple of weeks. You want to sleep. Kaitlyn was a sleepy, sleepy newborn. She was very hard to keep awake for feedings all day long. After her late evening feeding, however, she was suddenly wide awake and not ready to go right back to sleep. After a night or two of this, I had an idea. Instead of keeping the lights dim and sleep-friendly, I turned them on as bright as can be. She ate and went right back to sleep. I figured she wanted to stay up because her eyes were not used to bright light, so having it be nice and dark with low lights was perfect for her to check out the world around her. For a couple of days, I tried to keep her in lower lighting during the day and kept the lights bright for her late evening feeding at night. After a couple of days, her body was adjusted to being awake in the day and not the night. With McKenna, I tried the same trick and it worked again. Brinley never did have the issue of being more awake at night and less awake in the day. This led me to wonder if it was the timing of her birth. Kaitlyn and McKenna were both born late in the day–the 8 PM and 9 PM hours. Brinley was born in the 4 PM hour. I don’t know if it is just coincidence or if there is something to it. 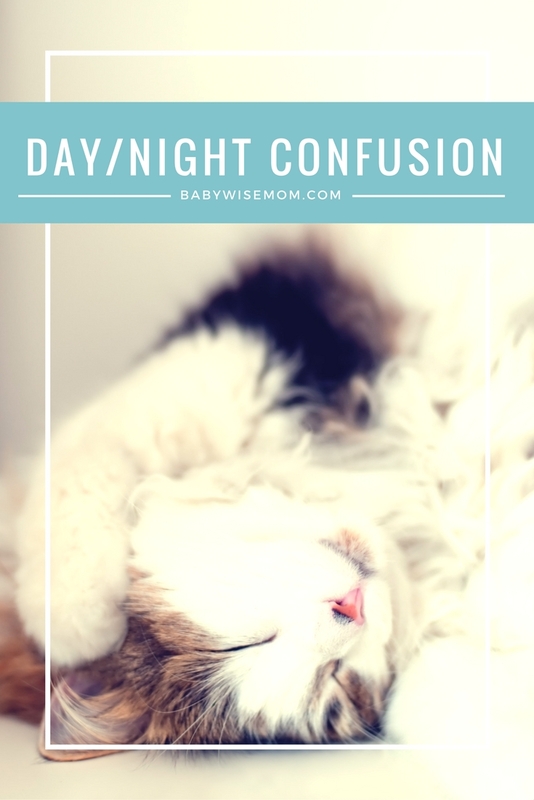 Do you have any tips for helping with day/night confusion? I think you're on to something with the time of birth. My son was born at 10:00 pm and stayed awake, of course, for several hours, but fell asleep and stayed asleep until about 10:00 the next morning. We've never had a problem with day/night confusion and I believe it's because he got started at the best time. My daughter is 12 days old and was doing great with sleeping at night with two 4 hour stretches up until a few days ago. I cluster feed in the evening and do a dream feed. Suddenly she is waking at 2:30 a. m. and then is awake until 5 when I give in and nurse her again just to get her to fall asleep. During the day she is on a 2.5 and 3 hour combination schedule. There are a couple of wake times in the middle of the day that I can not get her to have hardly any wake time. I can usually get her to nurse and that is it. I know that is normal for newborns, but it seems like she is getting all her nighttime sleep in during that time. I go outside with her a few times a day just so she can see it is daytime. I really don't know what to do…when she is wide awake at 2:30 how do I handle that? I have tried the 4'S but her eyes just pop open and won't close until I nurse her again. Any suggestions are most welcome!!! My baby girl is 1 week old. I just started babywise yesterday. She has been sleeping really well for all her naps so far. She barley cries at all. I have a question about the late night feedings. I am a really light sleeper and she sleeps in a bassinet next to our bed and I can hear every noise she makes. Sometimes after 3 hours I can hear her sucking and making noises like she is hungry. Should I feed her or wait for her to actually start crying? If she was in a separate room I wouldn't even know she was doing that unless she cried. When should I put her in a different room? I know with my son when I put him in his own room I slept a lot better. Hi,My daughter is 3 months old and, since she was born, has not been willing to go to sleep before midnight (sometimes not until 2 or 3am!). She is on a 3 hour feeding schedule (following the sleep, eat, awake-time routine) and will take 1.5-2 hour naps throughout the day. We have done CIO with her and she is able to fall asleep on her own after 2-3 minutes of fussing/crying. Our day typically is as follows:8: first feeding & awake time, 9-11: nap11: second feeding & awake time, 12-2: nap2: third feeding & awake time, 3-5: nap5: fourth feeding & awake time, 6-8: nap (have tried skipping this nap but she gets so tired after an hour of being awake)8: fifth feeding & awake time, 9: “bedtime”11: last feeding and straight back to bedAfter this last feeding, she will sometimes fall asleep for up to 40 minutes but then will wake up and cry/sleep on and off until sometime after midnight when she finally will fall asleep and stay asleep until 8 when I wake her for her first feeding. I check on her every 15 minutes and sometimes she will take a 7th feeding, but sometimes not. I’ve tried adjusting the time of our first feeding and keeping her up longer during the day along with the above advice, but nothing seems to dramatically affect her bedtime. I would love to be able to get her to go to sleep earlier than midnight (and to go to sleep myself!) as I know she is tired and trying to catch up on sleep throughout the day (I have to wake her up at 8am and from every nap during the day).Any advice or thoughts would be appreciated! Thanks so much. My 4 week old son was born at 11am and is always wide awake (and FUSSY) overnight, so I'm not sure its a time of birth thing. He was, however, very active in the womb at the time he is always up over night now (after the 10pm feeding), so I think its just a cycle his body always went through while he was growing and developing before he was born! I will give the lights on thing a try for a few nights and see if that helps! At some point, you need to get the lights back low. Not too long. Waketime should count with feeding even with a sleepy nurser, but if your baby is sleeping through the feeding, it will definitely cause napping issues. I have a post on that with the words "keep baby awake!" In the title if you want to read more. Hi, thanks for keeping up this fantastic blog! Our 7 week old baby had night day confusion from early on. She would fuss in 3 hourly blocks any time of the night e.g 4am -7am. The last few days it has gotten worse, starting at 9 pm all the way to 9am the next morning, getting snatches of sleep in between only. Does turning on the lights work for a 7 week old who is already used to bright light in the day? Also, this goes against all the other advice we've been reading: keep nights dark and day bright. What do we do with her when she cries at night? She can go on for hours! We are ok with CIO but it doesn't seem to help. Also, when we do PUPD or shh pat, she calms down for awhile and starts again. As the night deteriorates,we carry her to deep sleep only to have her wake at the next transition, then it goes on… We start the day at 9am and it's such a vicious cycle as she simply can't wake in the day though we've tried everything- even bathing her. She gets very angry and then sleeps.Thank you for your help in advance! My hubby is getting chest pains from the sleep deprivation hearing her cry from the other room. I don't know if it would work at that age, but it sounds like it wouldn't hurt to try it one night. My guess is she is too old for this trick, though. Does she have reflux? So she is sleeping well in the day, just not night? If that is the case, really analyze what is different with th day versus the night and try to get the night more like her days. Thanks for your response! Yes she was probably too old for the trick but she came out of the night day confusion after week 8 gradually. And you're right, at about that time, she was diagnosed with silent reflux as she screamed at her feeds. She is formula fed. She is now 12 weeks, on omniperozole and motilum. With meds, she has been doing ok in the day, with a long morning nap(about 2 hrs 20 min), two 1.5 hour naps then one half hour nap (she wakes herself from this nap only) before bath and bedtime feed. She has a dream feed at 1.30am as we wanted to keep her from being overly hungry and space out the night feed in case gastric juices built up over the night. She settles ok for naps but not well for bedtime and she wakes at the transition after falling asleep for the night (20min – 60 min) then cries for the next 1-2.5 hours. For the past 2 nights we resorted to feeding her 30 ml which seemed to help her settle a bit. We don't want to create a habit of feeding her shortly after bedtime though. We would also prefer to keep the 1.30am feed, and a feed at 10-11pm could put her off 1.30pm and have her wake for a feed 3-4am and affect 7am feed even more. Could she be undertired as she looks v awake during the crying stretch? This is her current schedule, would very much appreciate your thoughts!7-715: Morning feed (does not feed well as she feeds much better when she is half asleep)8.40: nap11: Feed (i wake her from all naps as its easier to feed. If awake she can struggle for an hour to get half a feed in. could be reflux effects…)12.30: nap2.10: Feed3.40: nap5.15: Feed7-7.30: catnap8.20: Bedtime feed(Takes long as she is awake and a lot of the time struggling with feed. Upright for 20 min after she finishes)9 onwards, 20 min from when she finishes: BedtimeThen after about 1/2 hour-1 hour sleep cycle, the crying begins and she can't settle. At all other times, she is able to settle herself. Thanks Val! Hi I know this is 2016, years later after the initial post but every time I have a baby I am on here looking at every thing I can find!! Thank you for what you have done for the rest of us! !Now my newborn had the same issue when we first came from the hospital( my third Babywise baby) he just wasn't willing to go in the bassinet for the first few nights and needed to be nursed and when he would fall asleep I would try putting him in his bassinet and he just wouldnt have it! So ( it must have been God!! Because I just didn't know what to do! My other Babywise babies would sleep in their bassinets when they came home from the hospital) so I felt it was a temperature issue. I put a fuzzy blanket as his sheet and used a heated rice bag in his bassinet before I put him in it to warm it up before every night feed. This worked!! He agreed to go into it! And he slept for an hour and half between feeds at night instead of sleeping on my warm body. Also if he still did cry sometimes when I put him down I put a pacifier in his mouth just until he fell asleep and then once I saw in the video monitor that he was asleep I went and slowly pulled it out because i didn't want to create a pacifier habit ( my other two never needed pacifiers) so this got us through the first couple of nights by the fifth night he is was willing to go into his bassinet which was warmed but no extra heating needed every time and no pacifier, waking up once around 1 am and the othe around 4 am for feeds! I also was very strict about DWT bing 7:00 or 7:30 am and followed the 2 and 1/2 or 3 hour schedule in the day and kept him awake making sure he got a full feed! So I hope this helps someone! It was deliverance for me!! Heat the bed and use pacifier if you need for a while, in a few days of applying Babywise daytime principles it will switch over!! I have a 4 week old who eats and sleeps well during the day, and quiet sleeping too, but at night he shortens his cycles from 3 hours to 2-2.5. He would sleep longer during the day too if I let him. At night he will go back to sleep but is restless and acts like he is bothered by gas. Sometimes he does this during the day too, but worse at night. He does not spit up at all. How do I lengthen his night time cycles and not his daytime ones? We keep him in the pack n play during the day for his naps and his crib at night. I have tried cluster feedings in the evening and a dream feeding and it doesn't seem to make a difference. Thanks for any help! My son is 10 1/2 weeks (1 week early). He had always been the best sleeper until about a week ago. He just stopped napping. Could not get him to go down and if he did go down it was for 20-30 minutes. I played around with his wake time and tried to play and then do something less stimulating before he went down and nothing worked. We did however have nighttime figured it out. He still woke to eat but he was quick to put down. Finally I tried him napping in a dark room and it instantly worked! However the two days we’ve done that are the two nights that we now struggle putting him down. Did I cause day and night confusion? His schedule is up at 7:30 and feed. Nap 8:30-10:30. Eat and then nap 11:30-1. Eat and then nap 2-4. Eat and then nap 5-6. Eat and then down at 8 eating again before down. Dreamfeed at 10:30 and night feed at 4 am.